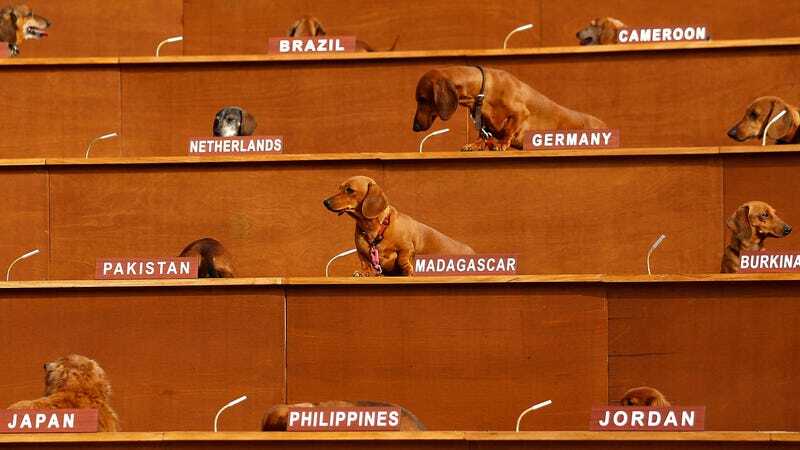 This is from an Australian art exhibit called “Dachshund U.N.” which had 47 dogs placed at United Nations spots in a giant set of risers. It also looks pretty great. Every country has tourist attractions geared toward a particular national idiosyncrasy. Just as the United States possesses treasures like the toilet seat art museum, for reasons that definitely don’t involve a big honking metaphor about the state of the nation, so too does Germany now have a gallery dedicated to wiener dogs. Our discovery of this vital new aspect of Deutschland’s culture comes thanks to the Smithsonian, which published a story this week describing the brand-new Dackelmuseum (literally “Dachshund Museum”) that opened in Bavaria on April 2. Started by Josef Küblbeck and Oliver Storz—the Wright brothers of dachshund museums—the Dackelmuseum features more than 4,500 dachshund-related items, including Küblbeck and Storz’ own pet wiener dogs, Seppi and Moni, who will reportedly make regular appearances, possibly to lead walking tours of the museum, or perhaps just encourage sniffing others’ crotches. The country is a fitting place for such a museum: As the Smithsonian notes, the first dachshunds (or “sausage dogs,” as both Küblbeck and the article itself keep delightfully referring to the dogs) were bred in Germany to assist on the common badger hunts of the 17th century. They’re especially popular in Bavaria; the “popularity is increasing because the sausage dog, with its so-called sausage dog look, has conquered the hearts of many people,” says Küblbeck, in arguably the most uncontroversial statement about the “so-called sausage dog look” ever made. Both dog owners gave up their careers to run the Dackelmuseum. Figurines, stamps, and even dog-shaped bread (per a Reuters reporter) are all there for the canine-loving traveler to appreciate, as long as the kind of canine you love is a wiener dog. This officially makes Germany 7 percent more whimsical, bringing the total amount of whimsy in the country—based on rigorous scientific analysis of wildly outdated stereotypes—to roughly 8.4 percent.